Provides clean burnout without staining the investment, enables casting of thicker objects, and prints with excellent detail to show the finest features of any design. B9R-3-Emerald: 1 KG (2.2 lbs) bottle. Developed as an improvement to B9R-1-Cherry based on feedback from jewelers. 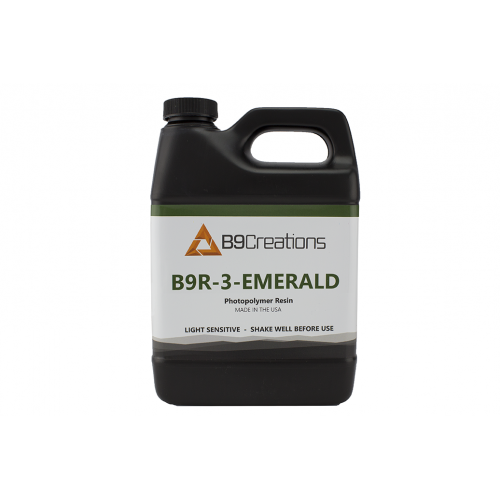 B9R-3-Emerald provides clean burnout without staining the investment, enables casting of thicker objects, and prints with excellent detail to show the finest features of any design. It also casts into gold, silver, platinum, and more. B9R-3-Emerald also offers improvements over Cherry in terms of castability, print speed and flexibility across a broader range of parameters. May be primed and painted. Printed parts may be used to create RTV or silicone molds. Note that some countries require special permits to import chemicals. We are not responsible for ensuring you are able to import to your country, please check your local requirements before ordering and importing this product. *Orders over 10 bottles may be subject to a longer lead time. B9Creator v1.2The B9Creator v1.2 arrives as a complete unit, ready to calibrate and print. The B9Cre.. Formulated for models with very small features and intricate details. Excellent for creating vulcani..
B9 Core 530 Bring your most detailed designs to life with outstanding precision and surface finis..
B9 Core 550When your business requires repeatability, precision, and surface finish with industry-le..
Bring your most detailed designs to life with outstanding precision and surface finish with the B9 C.. When your business requires repeatability, precision, and surface finish with industry-leading build..
Our wonderful B9Creations samples come totally free of charg..